Sunday Stamps time of the week again! 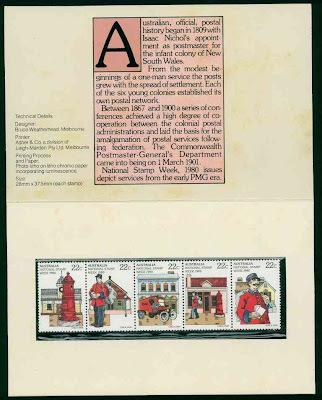 This week's theme calls for entries on the postal services. So herein is the I heart post's post on postal stamps featuring post. Tongue twister, much? 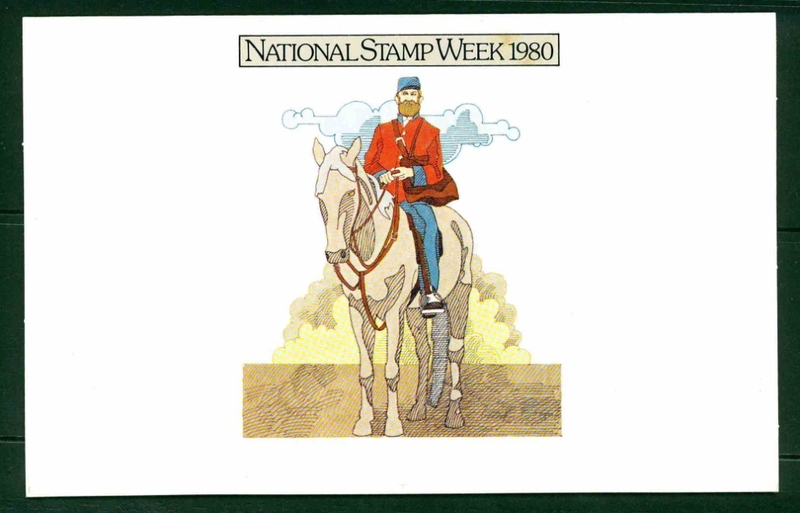 So this week I thought I would share a presentation pack produced for National Stamp Week in 1980. 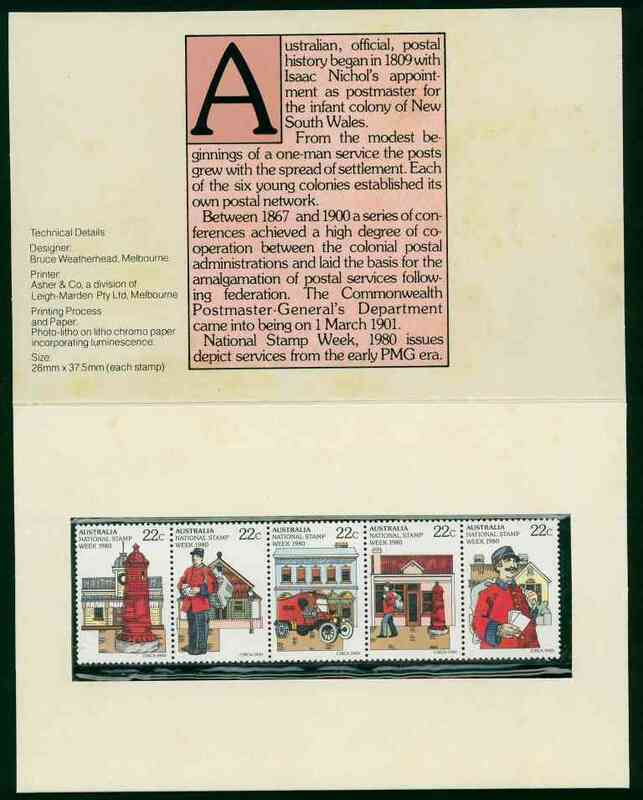 Unfortunately this particular stamp pack has aged quite badly - the stamps are still beautiful - but the presentation pack itself has suffered from 'foxing'. I am not sure if I am using this term properly, but the pack has developed some brown spots, which is a little bit sad. If anyone has any advice on what I should do about said foxing, I would be very happy to hear it. Luckily the stamps are still very beautiful. 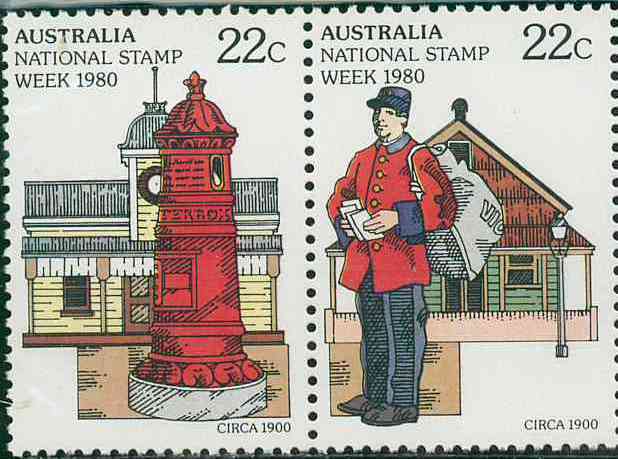 I love that the bright red colour of the post box, the postman's uniform and of the vehicle, really stands out and links the design of the five stamps together so nicely. I also really love that the designer has chosen to use colonial buildings (presumably post offices) as the back drop to the stamps. Also, as an added extra, I thought I would also show off these nice little stamps which celebrate the Birth of the Post Office. 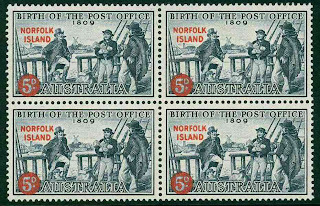 They are overprinted with Norfolk Island, so I thought that would tie-in quite nicely with last week's Sunday Stamps post too. Lovely selection of stamps. Have a look at this http://periodfinebindings.typepad.com/removing_foxing_and_milde/ about foxing and mildew. Thanks for the link - it sounds like a very complicated process. I guess I will just have to hope the foxing doesn't get worse! These are great, and as with other stamps posted for this week's theme, these are new to me. Thanks. Interesting that my stamp card comes from 1980 too. Yours are a far more attractive series, I must say. As for foxing, I don't know whether there is anything much an individual can do but I'd be interested to find out. I followed the link up above but that more or less confirms my feeling that it's a very specialist job to remove it and therefore *expensive*. They are nice cheery stamps. I have the birth of the post office one but have never seen the overprint before. I like the word 'cheery' - I think you are right, that is exactly what these stamps are! It's not just the colour of the postbox, but its shape that interested me. The Norfolk Island stamps are superb. That is a interesting series of stamps. I like the use of red too. 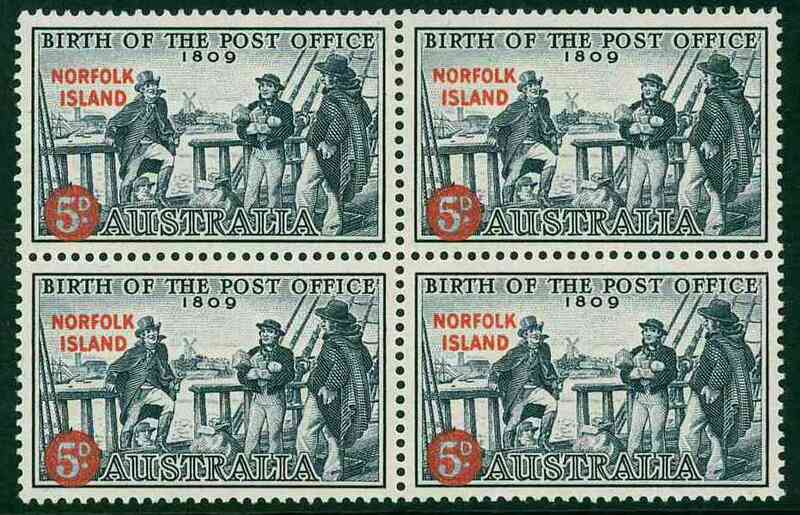 Thats a very nice block of four with the Norfolk Island overprint. Thank you for scanning the stamps in detail, so that we can see them. and thank you for participating. That is the most beautiful pillar box I have ever seen! If you ever want to hear about the awful demise of the traditional post offices in favour of new ugly buildings just ask my mum- it is one of her favourite rants. Funnily enough our hometown has still got it's old PO- or it did last time I had the chance to check.